A few weeks ago I posted an ecoGeek interview detailing Dell's environmental program. At that time, it seemed like Dell was in a holding pattern and there was little more to write until something new happened. Well, now there's a little more to write. 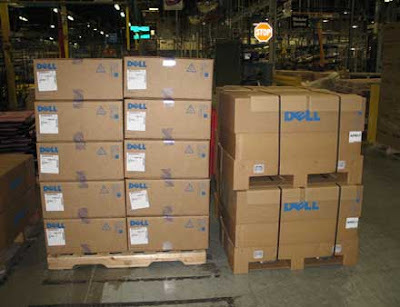 According to the Register, Dell recently revealed "project Multipack", a strategy to pack large numbers of systems in fewer boxes. Customers can now receive up to four 1U systems or 10 blades in a single box. As bonus, each box has a built-in corrugated pallet, which removes the need for a wooden one. And you only get one set of product manuals and CDs per box. All told, Dell thinks this plan will result in 2,000 tons of cardboard savings per year, plus a lot of other material savings.